Whenever I tell people I teach 7th grade English, I typically get three responses. The first is a sharp inhalation of breath. The second involves some form of apology. And then come the questions: How do I handle the hormones? What about the test prep? And all those papers? Teaching is indeed difficult work. Teachers must navigate a labyrinth of ever-changing standards while negotiating between children, their families, and administration. Rubrics attempt to help teachers by providing a way to streamline the workflow. Efficiency and equity all in one tidy sheet. This is a Faustian bargain, however. The gift of time is accompanied by a loss of professional judgment. The locus of control of our classroom shifts from the professional to the external tool. This essay argues for a reconsideration of the use of rubrics as the primary mechanism for writing assessment. After examining the historical context of the rubric, I attempt to make a case for the use of narrative feedback. As America entered the twentieth century, our country’s society was in a state of upheaval. Unforeseen levels of immigration dramatically altered the landscape of our urban areas. Advances in transportation helped break apart the traditional small-town dynamics governing much of the country. And the rapid growth of print media provided America with massive quantities of information both relevant and hyperbolic. Social institutions such as public schools attempted to meet the changing demands of a culture in flux. What role should public education play in this new landscape? Multiple interest groups spent the early decades of the Progressive Era competing for the right to answer that question. Whichever group came out on top would earn first crack at the ability to shape the national debate over schooling and frame education in their own image. The Humanists wanted to use education to carry on a legacy of Western classicism. School as a civilizing machine. The second group, the Developmentalists, was only interested in following the whims of the child. School as a playground. The final reform movement, the Social Efficiency group, pushed for a vision of schooling rooted in the economy and the language of business. School as training ground for work. As the 20th century wore on, the reforms pushed by the social efficiency movement became the dominant mode of thinking about education in this country. Many of the hallmarks of today’s public education, such as testing, demarcated bodies of knowledge, and teacher accountability rose to prominence during this time. The social efficiency movement aligned itself with the growing scientific management revolution. Scientific management is a theory of organization that attempts to maximize efficiency and eliminate waste through the use of scientific techniques. Think rationally organized systems of production, external incentives, and clear delineation of roles and responsibilities. Public education drew heavily from scientific management theory. Politicians consolidated power under the newly created superintendent, instituting top-down hierarchies of control. Information went from those in control to the workers: teachers. Administrators were in charge of navigating student data and issuing mandates to the classroom in a clear chain of command. Rubrics align themselves with these values. They subordinate the complex, messy process of writing to the machinery of efficiency and standardization. Rubrics break down a piece of writing into discrete components such as punctuation, voice, character development, and organizational structure. Products (student writing) are sorted and ranked according to how closely they align with ambiguously defined perfection. Teachers then give directives to students who are expected to perform in uniform fashion. This classroom paradigm strips both teacher and student of agency and individuality. Everyone is expected to do what the person above them orders. Fast forward to the 1960s. The launch of Sputnik in 1957 set off an intellectual arms race in the United States. Political education reformers pushed a ‘Back to Basics’ approach, calling for an increased emphasis on math and science in the classroom. With “soft” subjects like writing now under scrutiny, politicians expected schools to prove an academic discipline’s worth in scientific terms. For composition, this meant creating an assessment that was both valid and reliable. A landmark 1961 study sponsored by Educational Testing Services created what many consider to be the first rubric used by schools on a nationwide level. Many teachers and education scholars raised concerns over rubrics, arguing that such a lock-step assessment tool ignored important contextual and local factors. Despite these reservations,. ETS’ rubric became standard practice in classrooms across the country. The prevalence of rubrics in today’s schools points to a continued cultural drive towards standardization, uniformity, and efficiency. Rubrics have also become a lucrative cottage industry. Educators like Robert Marzano have built careers on selling rubrics. Schools across the country use Ruth Culham’s 6 + 1 Trait writing rubrics. The point here isn’t that teachers have been duped into using a faulty assessment method. Rather that the rubric, an apparatus of standardization born out of the need for efficiency and uniformity, have become the accepted arbiter of composition quality. Cultural zeitgeist or not, the ubiquity of the rubric speaks to its ability to meet a specific need. Teaching is an extremely demanding task. Educators routinely report record levels of occupational stress. Misguided education policies pack more students into each classroom. Politicians require more of teachers while refusing to build in the time necessary to meet the additional demands. A relentless focus on education’s bottom line suggests that scores on a rubric carry more weight than a holistic teacher response. Rubrics promise to help composition teachers navigate these problems. They offer us the illusion of efficiency and equity. They streamline the complex and time consuming task of reading and responding by using a template built on assembly-line economics and standardization. The biggest sin of the rubric comes from its capacity to hijack and distort the rhetorical purpose of writing. We write to communicate to ourselves and to others and to document the human condition through written word. When we respond to writing through a rubric, we lose this rhetorical imperative. Our responses become fractured and piecemeal, jagged shards more adept at impeding a piece of writing rather than strengthening it. Our experiences have taught us to approach student writing as a technician. We read to diagnose and to fix. This isn’t how I read when outside of the classroom. At home I enter into a text with the hopes that I’ll enjoy what it is I’m reading. Reading and writing are meant to be fun. As teachers we need to revel in the joy of watching our young charges figure out how to express themselves. What do they want to say? How can we help them get there? What is the student’s writing goal? Where is he/she in relation to that goal? How can you help he/she reach that goal? A rubric can play a role in this process, but what is gained in doing so? By ditching rubrics in favor of more descriptive narrative feedback, teachers are free to rely on their own understanding and command of composition. This type of feedback honors the teacher as a professional educator trained in reading writing. It gives teachers the freedom to grow, listen, and respond to their students. We can come to each piece with a sense of humility and wonder, eager to join each student in the rewarding process of committing thought to paper. Responding without rubrics helps us come home to what drew us to our profession in the first place. Today we get to hear from Peter Anderson himself. And as amazing of a blogger as you know him to be, doing a presentation and live blogging it simultaneously proves challenging–even for him. So this post comes at you from today’s lucky guest blogger, NVWP ISI co-director, and Peter’s “shoulder partner” Amber Jensen! Here we go! The energy is high in the room as Peter informs us that he is going to “tell us the story of his classroom.” As we are all aware of his enthusiasm and deep thinking about his profession and practice, we are all eager to hear what he has to share with us. After a quick overview of the demographics of his current school, he asks us to begin by reflecting on our own situation. Quickwrite: Imagine you have complete freedom to change anything about the way you run your classes. What changes might you make? What stops you from implementing them? Yikes! How does he type the answers to these questions while blogging during these presentations? Um. If I could change ANYTHING, I would make the students the ones who make the decisions about what they are doing. I would want to make learning more of a process of students’ discovery, guided by the questions they bring to the classroom, and creating products that mean something to them and have an impact in the world. Luckily, I did find myself in a situation where I did have complete freedom to design a course without the constricting parameters of state-mandated POS standards (yes, the irony of that acronym is not lost on me — or anyone). Advanced Comp is exactly the course I would want to teach because it is truly student-run, open-ended, and driven by student response to student writing. My role in it is to get the ball rolling and to see what the kids produce. It’s the class that energizes me most because I am permitted to experiment, to engage with the students as humans, and this allows for the kind of learning that matters most. I understand, though, that not every teacher has this freedom, particularly in the era of common assessments, data-driven decision making, and standardized tests! And then Diane (hmm, Peter, was she a plant?) 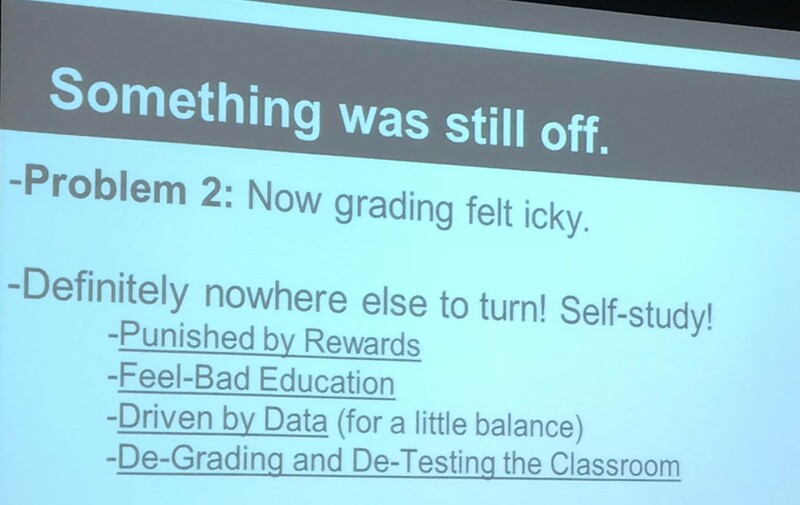 conveys a dream to get rid of grading! ” “Let’s talk about the problems I faced!” Peter says. He shares with us the work he put in during his own self-study to learn about rubrics. The quantity and depth of Peter’s own investigation on his problem is what I admire most. He shares with us that rubrics are “historical artifacts” rooted in two times and places: the Progressive Era and 1960’s Positivism (Sputnik!). The mindset of quantifiable, measurable, empirical approach lent itself to quantifiable, measurable, and empirical assessment. Enter rubrics! ETS created a 5 point rubric and set the scope for the national rubric scene. The problem with this, though, is that standardized assessment promotes standardized writing! Rubrics compromise the rhetorical purpose of writing; students are writing to get a grade, not just to achieve a rhetorical purpose. The power dynamic between teachers and students is compromised by rubrics. So what to do with this information? Throwing out grades was a revolutionary move, one that he expected to be met with glee from students and, at the least, hesitation from parents and administrators. From what he expected — “Thank you teacher!” — to what he got — “This isn’t fair! How am I gonna know what I’m gonna get?,” Peter didn’t realize the response would be so strong. 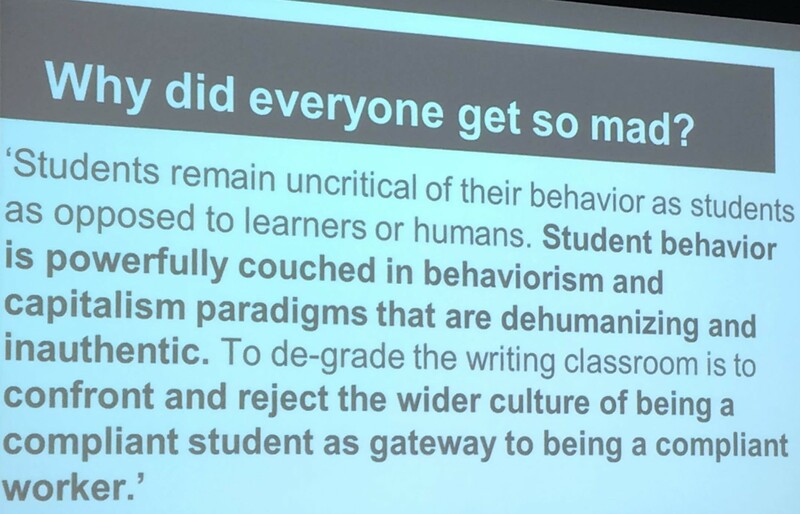 But by reading further, he came to understand that “to de-grade the writing classroom is to confront and reject the wider culture of being a compliant student as gateway to being a compliant worker.” He shares that he realized now why it was so upsetting – without grades, the students’ and teachers’ reason for being was now gone. So he reached out to his students to reflect on the process. What came up again and again was that the high-flyers, the ones who had been rewarded for knowing how to play the game, were the ones who were most upset. Other students realized that this process was valuable — and, whether they liked it or not, it made them think! Got ’em! Guiding words from Paul Thomas! Quickwrite: To what end do you educate your students? Job training? College? Democratic citizens? Lovers of reading and writing? The “real” world? Well, I don’t know if I am successful at this, because admittedly, I think some of my pedagogical choices do reinforce the grade-motivated learning system. At least in my 9th grade class. Honestly, mostly with the standard-level students even though, ironically, they generally aren’t as grade-motivated as their advanced-level peers. While I do try to invest students in thinking about bigger world problems, to consider their own role in the world around them, and to be conscious change-makers, now that I think about it, I’m not totally sure that my curriculum directly supports that. 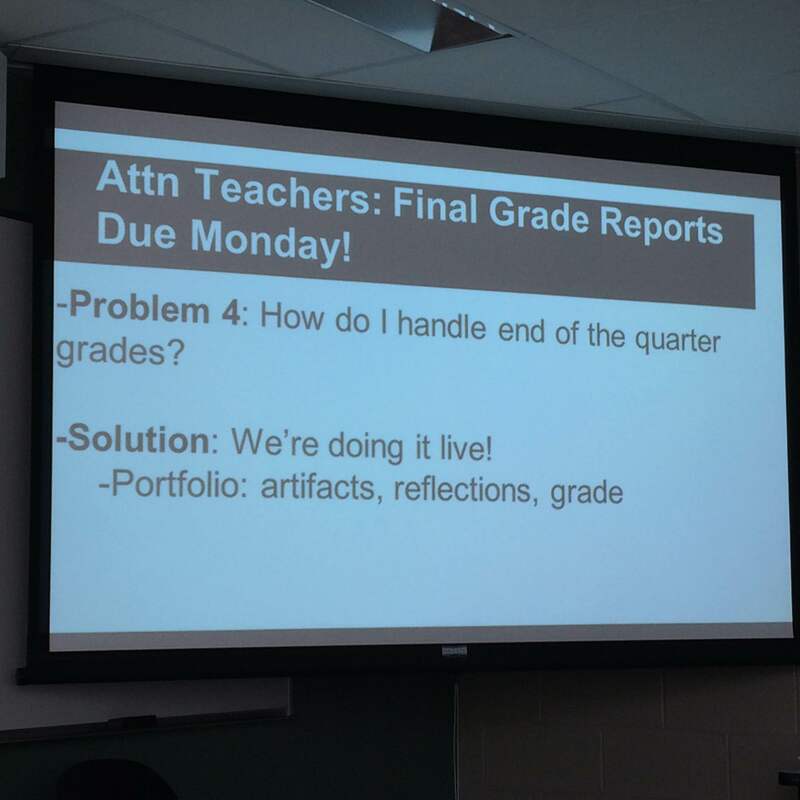 I am familiar with the “but what about my grade?” conundrum. It happens even after we have a really engaging debate or discussion in class. I grapple with myself – so do I need to give them credit for participating? Or is it enough just to be here and experience it together? Ugh. My Advanced Comp class is different, though. Grades are irrelevant. These students are being educated to work together, to find meaning and purpose in their goals, to identify problems around them that they have the skills to solve, and then to employ the right strategies to employ them. WWJDD? What Would John Dewey Do? This is bringing up some great discussion around the room. 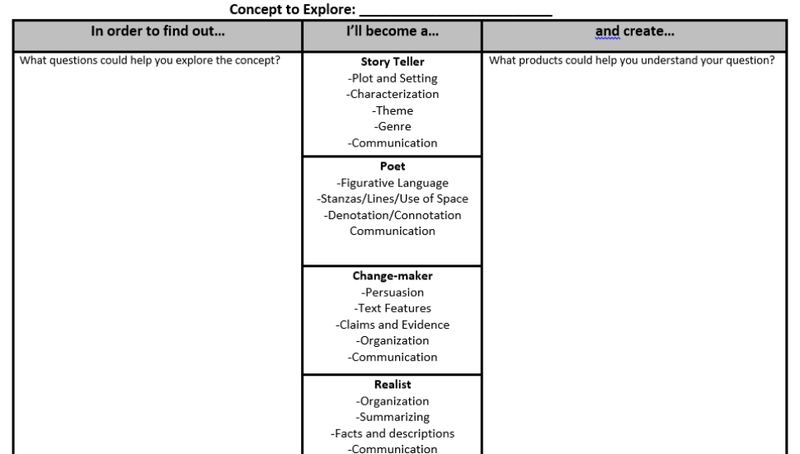 Questions like, “How do students know what options they have within each of their roles?” and “How do you scaffold the learning when students are all working on a different genre?” Peter promises to address these questions, but first, we get to practice on our own using our very own ROLE organizer sheets! And finally, Peter addresses everyone’s unspoken concern: what grade will he submit for students when that inevitable emails comes in from the administrator? He shares some student reflections to give us examples of how the students were able to reflect on their own progress, and tells us about how he conferenced with them individually to come to consensus on the grade that would go on their grade reports. Dialogue Journal: Writing an honest dialogue/conversation with someone we know well. The process of writing the dialogue allows the relationship and aspects of the relationship to emerge and move forward. First step is make a list of persons you would like to have a dialogue with (Progoff said people die but relationships don’t.) This should be with someone who you know well enough to write their own stepping stones. Someone you’re familiar with. First step is to list people you’d like to have a dialogue with. The point of making the list first is to have a menu to select from. So pick someone. My Uncle passed away yesterday; I’m going to select him. Next write a focus statement. Focus Statement: Two to three sentences about why I want to have a dialogue with this person. Why did I choose this person? I want to have a conversation with you, Uncle David. We never really talked or got to know each other. I know this sort of goes against the requirement of knowing the person well, but that’s OK. It’s my writing. Arbogast talks about the difficulty of conversations. About how we are typically listening only to respond. An I-It relationship where we’re centered on ourselves. This contrasts with an I-Thou relationship that honors the other person. The trick in writing a dialogue is to get to the I-Though relationship. We do this by writing out the stepping stones for that person. Write them in the first person to get a sense of what it must have been like to walk in that person’s shoes. I’m pretty sure the writing I’m about to do is an I-It relationship. I’ll do my best to follow the instructions. I was born in Pittsburgh, Pennsylvania in the 1960s. I graduated from college (where I had an amazing time) and moved out to Texas to work for a big company. I took care of my mom for a time. She came to live with us in Texas. She loved the pool. I married, had a daughter, and developed cancer. I spent the final chunk of my life battling the disease. There’s one final step before we write the dialogue. We close our eyes, relax, and let the imagery present itself to us. Observe the Twilight Imagery and record it. P: I just read your stepping stones and it made me feel, well, sort of empty. D: Empty? That’s an odd thing to say. What do you mean? P: Well, like, I couldn’t remember much about you. Or about us. Or about the family. Why is that? D: You weren’t really around. I moved halfway across the country. And you know how much this family hates moving. P: Yea, I don’t want to get off topic, but what’s up with that? It’s definitely a trait of mine. I don’t even like leaving the house past 7:00 pm, much less relocating my physical body multiple states away from home base. D: I’m not sure. But I don’t think we’re here to discuss family migration patterns. P: You’re right. But I’m not sure what I want to talk about. I don’t know you. I never really knew you. What invisible bonds does blood create? What tethers us together? Is a family characterized by distance and unknowing still a family? Now that you’ve passed, how should I feel? Last night I conjured up your face. But all I could think about was my mother. Her pain and sadness. The passing of her first sibling launches her into a phase of life that scares me in its finality. The regrets she has about never providing a close-knit extended family. This wasn’t her fault, of course. But I know, or at least can guess, at just how badly she feels. D: So it sounds like you’re asking me if it’s okay not to miss me. P: I guess it is. I’m sorry. P: For never reaching out. For never taking the initiative to instigate some form of communication with my dying uncle. For thinking about you less than I thought about characters on a TV show. How do I remedy this? What penance must be paid for my willful ignorance, my turning away? How can I make this right? D: You can’t. I’m gone. This is intense stuff. We take a break to clear out some of the emotional charge still sitting on top of us. Inner Wisdom Dialogue is the last activity we’re going to do. The inner wisdom dialogue is one in which we have a conversation from history or mythology or an ancestor or a deity or fiction. Someone who inspires us in a connection with a meaningful life. Make a list of wisdom figures. People who you want to speak with about the big life questions. Look at the list. Maybe you’re drawn to one. Maybe you’re pushed away from one (that’s probably the one you should speak with, btw). So pick one. As with the other dialogue, write a focus statement. A simple declaration of a need or a question. What do you want that figure’s help with? I’m going to choose Alfie Kohn. Focus Statement: How do I sustain a progressive philosophy of education (and life) in the face of such overwhelming odds? Imagine the figure is walking towards you. Greet them and let the dialogue unfold. The figure might change in the middle of the dialogue. If that happens, go with it. A: Hello there! It’s so nice to see you. I’ve enjoyed reading your blog posts and your Twitter feed. P: How do I know what I’m doing is the right thing? How do I know I’m on the right path? I read your books. I read your blog. I read your articles. Yet I often feel like everything I experience day-to-day goes against your wisdom. A: Join the club. I’ve felt that way my entire life! P: But then how do you know what’s right? How do know that the opinions you’re giving aren’t misguided? A: Well, why do you ask? Although I’m pretty sure I know the answer already. P: Because I don’t know what’s right. I don’t know how to teach. Grade or no grades. Test vs no tests. Preparing students for life, for college, for vocational positions, for academia. These tracking systems we have in our society are so ingrained. How do I know what to teach each student? P: What if I’m only doing these things because I think they’re right independent of studies and research and “best practices?” Isn’t that selfish of me? A: I can’t answer these questions for you. A: Because the answers can only come from you. Like you said, this is your system of ethics you’re developing. Your personal philosophy of how education should work. P: But I want to do what’s right. 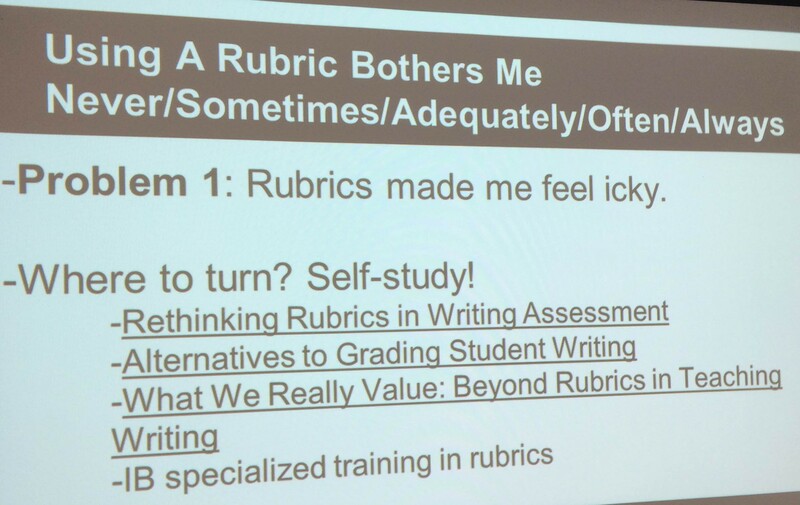 But what if rubrics are the best way to improve student writing? What if John Dewey was wrong? Or, more accurately, what if I’m only partially right? What if this tiny sliver of knowledge I’ve gleaned over the past twelve months is a misreading? Maybe I’m in over my head. Maybe I only have my own best interests in mind. A: Do you think that’s true? P: I don’t know! That’s what I’m asking you! I want a mentor. I need a mentor. I need someone to tell me that what I’m doing is the right thing to do. That I’m heading on a path of authentic experience. That I’m going to make a positive difference to something or someone outside of myself. Or maybe I’m taking this way too personally. I feel like I’m placing myself up on a pedestal of solipsism. A pedagogy of narcissism predicated upon masquerading my own interests as what’s best for students. I’m afraid I’m not good enough for all of this. That I just don’t have what it takes to carry on a progressive, learned approach to teaching and learning. That I have nothing to fall back on. That I’ll look back in five years and hang my head in shame at the misguided techniques I used in the service of some false progressivism I didn’t even know enough about. A: Keep walking the path. Keep reading. Keep writing. Keep thinking. P: I had a feeling you would say that. Phew! We share out. Tears galore! Mucous out the wazoo! This is the raw stuff that becomes amazing writing. These journal prompts work really well with students. It helps them generate ideas to write about. Come back to it throughout the quarter and semester and year. Turn these ideas into fiction by changing names. Using the images and phrases to start and end poems. Personal narratives stemming from any of the stepping stones. Poems for two voices with the dialogue. Using the dialogue to help students write…dialogue. Use a literary character and write out his or her stepping stones. Keep recording! Mindfulness! To practice coming home to your body. To becoming aware of existing in a space. Now we run, partially hollowed out by the emotional purge, to lunch.